Seems to me we would do better if our memory was multi-generational; it's easy for someone to ignore the damage they do to others later. The pandering of Media melodramas do not make up for the loss of cultural memory. Finished the last of the red cabbage we had so much of last year. Just a few carrots left and the onions and garlic are starting to sprout. I can see why in the Anishanabi calendar April was the 'hunger moon' because the food runs out. Lucky us now with better storage. About to make the big start of garden sets next week. Raining. On serveral feet of snow. Flood alerts are out. Last night the snowpack on the roof came down sounding like an avalanche; had to dig out the paths to the doors. Living out in the woods is good as long as one stays capable. A glaze of ice over the packed snow makes creepers on boots necessary. We expect an extended mud season this year, but the worst of the cold is over...I hope; no guarantees. Sitting in the bright sun at my desk. The snow is almost at eye level outside (sitting) from what's slid off the front roof. Birds are active..chickadees and nuthatches with a variety of woodpeckers; we've had pine grossbeaks every day lately, but they're fickle and will be gone soon, moving on. Still only occasional red polls and pine siskins, but the goldfinch are back most days and starting to get brighter. Not long before we'll hear the "Hey, Sweetie!" from the chickadees. Good to have time at home. It's been busy and more to come. Winter Quarter is just over at U for Seniors; good classes. I plan to do a short class there on fungi for Fall quarter. Not much happening with mushrooms right now; still lots of dried and frozen left. I plabn to take a turn at being an officer with Paul Bunyan Mushroom Club; we'll see how well that works. I've also decided to try to get down for the mycoflora meetings a couple times a month. Easier to rationalize the trips with the EV charged from our collector. Karen is in the middle of practicing for the next DSSOC musical event in April. Choir at St. Paul's goes on for a couple of months yet, too. Winter has slowed us down but living in the woods is good. Talked to a person from Alabama this morning; always kind of fun to brag about double-digits below zero temps. But I'm getting a bit weary of it, anyway. We've had bonzo snow and I've gotten out snowshoeing but not skiing. Sophie and Dan--who were up skiing near Ely--stopped by on their way home to the city and may be back to ski this area. For a couple of extroverts we have an introvert house with no guest room; our only 'room' is the bathroom and otherwise we can talk to each other from anywhere. On house matters, our twenty year old composting toilet is starting to make funny noises and Sun-Mar doesn't have parts for that old a machine; so looking at Natures Head as a smaller footprint, separating, and more economical model. Forgive me if this offends anyone, but CTs are such a common sense solution that I'm sold on them. We accomplished the commisioning of our solar collector and are now pumping electrons out for our use and the rest of the network. The level 2 charger is quicker and more convenient. Should do away with electric bills, too. Leek sets are pokeing up and greens are starting to grow faster in the greehouse. Maybe Spring is coming. Just coming out of -35 F nights. -30 is about where centigrage and Farenheit briefly equate; thin compense for the weather. We mostly stayed indoors and minded the masonry heater, doing morning fires to compensate. Regardless of tolerating sub 60 F briefly, we survived quite well and made good use of the fires to cook meals and warm us. Our provisions are doing well: frozen, dried, growing in the greenhouse (requiring some extra heat now). Our store of wood will last till Spring. Bea (our furry Pyrenees) even likes the weather. Our EV Chevy Bolt is surviving but beyond design specs at -20 F, so using the RAV4 on these days. Our solar electric collector is up and ready but for the inspection by the powers that be; soon to be powering the EV and our house. A very busy autumn and winter is not slowing down much. August and September were taken up for me by the thin-balsam and plant-hazelnut projects. The archery is on hold. Finally got the hazelnut area cleared (saved the woodpecker hole) and half fenced, using the right-sized balsams for fenceposts (skinning them is significant work). I seem obsessed with finding good ways to re-use the balsams; some innoculated with Trametes are showing signs of fruiting but not as well as on aspen; new chips on a lot of the paths; larger logs awaiting cutting for timbers that I'd like to use for a chicken coop. In late August, traveled to near Fargo for hazelnut plants and got 18 total, some free seconds; now (Nov) in the ground and fenced. The other half of the field is for more sets from different genetic stock and needs to be smoothed out ant fenced; make fenceposts this winter. I have nuts in the frig to start in March; had hoped to innoculate them with pecan truffles but a source eludes me. We also decided to install a solar collector so we can power an electric car and give up a petroleum car. Jerry Lilyerd of Sun Energy who put in our hot water solar collector is doing that and we should have it done by December. Unfortunately one of my favorite maples behind the house had to come down in a tight space; finally got a tree service to drop it for me; we will thank it to warm us in a couple winters from now. I dug the hole and Jerry installed the pipe just before frost-in-the-ground. Shopping for an electric car, we decided on a Chevy Bolt which has the longest range and found a somewhat reasonably priced car...in Texas..so I negotiated the airfare down and drove it back; about as long charging as driving, but cost me $13 for 'fuel' at easily accessed charging stations, about half of them free; there are good apps for finding them. So I got a road trip out of it, heh. Working well so far. 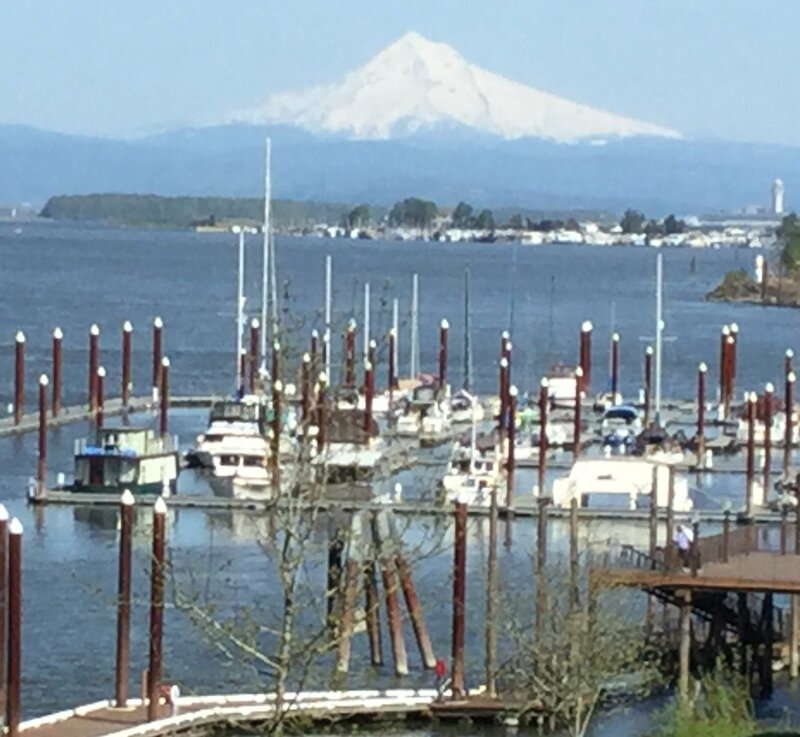 We spent mid-October visiting friends in northern California and attending the NAMA foray in Salem, Oregon and doing the volcanic trail and Oregon coast along the way (trip report in process yet). Snow on the ground for a couple weeks, now. Going up to neighbors for Thanksgiving. Well into the heating season. Winter. A hot summer week coming up. And I still have ground to clear; most folks would wait until cooler September/October to do this. But it's going pretty well, if slowly; I stop when the sun gets around on me. Still no lobster mushrooms or hedgehogs on our land; mostly Russulas. Went farther south and found enough chanterelles for the winter. Also tried a great new recipe for Chanterelle Biscuits with Chicken that I put up on the Paul Bunyan recipes page. Goes great with broccoli fresh from the garden (we have LOTS this year). Not much action from cultivated mushrooms, although just harvested a couple pounds of winecaps. I made the trip down to foray with the MMS in July as well as the Paul Bunyan group; will again Aug 25. Plan to make the UP foray with the Michigan Mushroom Hunters in early September and do a walkabout around the Keewenaw Peninsula. No more plans then until NAMA in October. The garden is prolific this year, with rain pretty much as we've needed it; sometime more than we need at one time (5+ inches in two days once). Early cabbages are out and filling the bottom of the refrigerator; several given away. Red cabbages need picking now. Radiccio and beets have meant lots of salads with blue cheese and walnuts. The romaine lettuce was good too, but that's done now. Pole beans and summer squash are keeping me busy freezing for the winter; broccoli too. I may have finally figured out how to grow parsnips which look good. Carrots and onions about ready to harvest; the shallots are drying in the greenhouse. Cucumbers and tomatoes have started, and peppers look good. I really enjoy the hour or so of attention to the plants early in the morning; some of the best meditation. We have spent the last month during July watching parents feed their fledging and teach them how to use the three bird feeders on our platform feeder out our dining room solar windows. First it was the hairy woodpecker family: one parent would feed a fledging - usually standing on the bar above the feeders, but sometimes on the bar up the middle next to the peanut feeder - several times, and then try to encourage them to use the feeder on their own. Sometimes the parent would just fly away. This behavior went on for several days. I think the hairy woodpeckers we saw had two or three fledging they were teaching to feed. Next, we saw the evening grosbeaks - the chicks would stand on the platform and flutter their wings and cheep at the parents, and the parents would feed them from the black oil sunflower feeder. This also went on for several days, after the hairy woodpeckers had left the peanut feeder, and once we saw the whole family - two adults and three fledging - on the pin cherry eating that fruit! We had a rosebreasted grosbeak juvenile male for a couple days and then a rosebreasted grosbeak female - looking like a much larger version of a female purple finch - trying to eat from the peanut feeder, with their huge bills -even though there was lots of black oil sunflower on the platform. We saw chickadee parents feeding their two fledging at the same time, but they left behind a runt with big eyes and not a lot of feathers. He almost didn't look like a chickadee, but he was eating peanuts and other seeds off the platform. Hope he's surviving! We are also seeing two chipping sparrows and their juveniles who have hanging around for a couple weeks and eat from the platform, and occasionally we see them in the bushes around the feeders. The goldfinch returned near the end of the month and we're again seeing downy woodpeckers including some small ones, which we didn't see at all during the couple weeks when the hairy woodpeckers were teaching their fledging to eat; they must not interact at all. It's good to see the downys back! This year in addition to nesting pileated woodpeckers out in a tree close to the driveway (which necessitated Gene's putting off clearing the land for his hazelnuts (which he picks up August 25th) for nearly two months, we've had hairy woodpeckers, evening grosbeaks, chickadees, white throated sparrows and a couple rose-breasted grosbeaks! These species may have been here every year quietly nesting, raising their young and teaching them to eat from the feeders, but we have never noticed them as much as we have this year! Gene saw a golden-winged warbler and a cerulean warbler while paddling at Boulder Lake the morning of May 16th. Karen has heard the hermit thrush several times, out by the shelter, during the week of May 16th, so we are up to 38 species seen and heard for the month. We're seeing more rose-breasted grosbeaks, both male and female, than we usually see around here. On my birthday, May 17th, I saw a pair of Indigo Buntings! I've never seen them here and probably haven't seen them for 20-30 years. One came up to sit on the top of the awning so we could get a good look at him/her. A few minutes later, Gene saw a black-throated blue warbler in the balsam, another first sighting for me, and the evening grosbeak pair were back after being gone for months. Male hummingbirds at the feeder are jousting and fighting with each other, probably trying to claim their territories. The black-throated blue warbler has now been here three days in a row since May 17th and is on and off the platform all day, especially after I put out fresh oranges yesterday afternoon. The fresh oranges attracted either a female Baltimore oriole or a juvenile. It was brown with a large and long orange breast. On Tuesday May 23rd we saw a bright orange male oriole with a black head who wasn't interested in the very old oranges but was very interested in the hummingbird feeder and was able to drink from it at length. He moved on after Tuesday, neither of us saw him again. What's staying around (mid-May)? Rose-breasted and evening grosbeaks, many goldfinches and purple finches, hairy and downy woodpeckers, male and female hummingbirds, and siskins from time to time. On May 29th we saw an adult Mourning warbler! Grey head, black bib ,bright yellow chest and stomach. That's 42 species for May. A couple days later we watched the evening grosbeak pair doing their mating behavior: the female flutters her wings, male feeds her and then does his Prairie Chicken imitation: spreads out his wings and tail, and struts around! On our way to Sugarloaf Cove May 31st we saw two juvenile moose calves on the way home! I have not seen a moose in at least three years, perhaps longer, they were on the side of Lake Co. 16/Forest Road 11 which is a very nice blacktop road, Wonderful to see! They looked very healthy. On June 3 I saw the pileated fly low and silently into the woods from their hole in the poplar Gene was planning to take down for his hazelnut planting area. Now he may have to wait to clear it until the end of July. Gene's been watching them work at enlarging the hole for a few days so evidently they will build a nest there. A couple days later I walked Miss Bea by the pileated nest hole. The tree is pretty close to the driveway. The female flew into the woods, silent again, and we didn't see her on our way back. We looked up how long woodpecker eggs take to hatch from when they are laid: 11 to 14 days. Then it's another month for them to fledge: they don't leave the nest yet but they are able to be left alone for awhile when the parents go to feed themselves. Both male and female pileateds take turns sitting on the eggs and then feeding the young. Last year it happened on July 2nd, 2017 and this year it was June 6th: a hummer was busy trying to get nectar from the Siberian Iris and yellow Iris right in front of our dining table windows, even though I just changed the hummer food this afternoon. The second week in June I saw a Blackburnian Warbler, while Miss Bea was drinking water from the bucket at the shelter: I was behind her, quiet, in the shadow of the shelter. It had a light orange throat and a little yellow on the cheeks and a black body and wings. I watched her wash up, probably after bathing in the pond. The last couple weeks Gene has disturbed a very small fawn whom the doe probably left hidden in the woods while she went to eat. They are supposed to stay in place; this one evidently doesn't. The first time the fawn ran across the road, the second time, thankfully, the fawn just ran across our driveway and into the woods. When they are this small they are still nursing and very spotted. We worked very hard at stringing up raspberry plants onto 4' sticks in the west area right outside our door, and also a strung up a few more in the back of the house. This is an experiment; we haven't tried to string them up before but it seems they would get more sun this way. Both areas needed major thinning, and the west area has never been a good source for raspberries. It looks like this summer will be different because the plants have blossoms and small berries already, near the end of June. Karen has a new project: weeding the garden! The area near the back fence (aka "dog run") is full of weeds, dandelions and invasive dodder. She's only able to work at it for about an hour, when the weather is not too hot, but it's slowly getting completed and then she can move on to other areas in the garden proper. What a difference a month makes. Or even a few days. Last week we had 5 inches of rain in two days, but still not as much as some. We are into deep green summer and the understory is losing out to the canopy. Still a lot of spruce budworm damage: dead, brown balsam that needs removing to reduce fire hazard, at least near the house. In May, I put my efforts into clearing where I want to plant hazelnuts. Maybe I'm not supposed to do that . A few weeks ago, I was thinning balsam there and was surprised by a grouse exploding up from the ground a few feet from me; they do that. But I looked down and there were over a dozen eggs in a nest. So I postponed working there until the chicks were out. A week later, a fox (?) got the grouse, so I fired up the chainsaw and continued. But a pileated woodpecker was making a lot of noise on a big poplar in the same area. Yep, a pair were excavating a cavity in that tree for a nest, and are now evidently sitting on eggs. We checked some references, and they should fledge by the end of July. I wonder who will be watching me then? 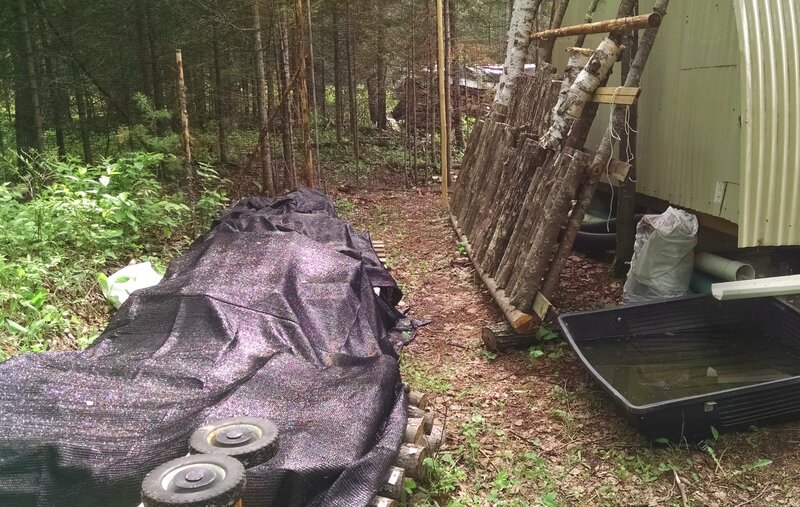 I've been wanting a shady area to put my innoculated mushroom logs so I can watch and care for them, so set up a rack and pallets with shade cover behind our storage shed. Just in time for my four year old birch logs to flush with more shiitakes! Karen and I are volunteering at Sugarloaf Cove on Thursdays this summer. It's a great natural area and Karen is site host in the center while I walk the trails and talk to people; a couple of my favorite things! Also doing some fix-up projects while I'm there. It's a pleasant trip through the woods with lots of wildlife. 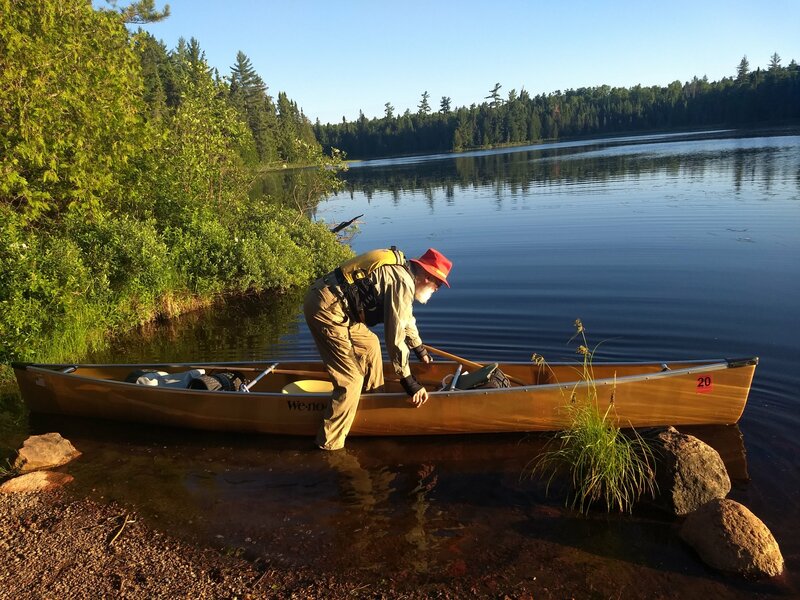 Also busy preparing for a solo BWCA canoe trip in July! Been canoeing (the lakes are back up after the rain) and getting out my sometimes ancient equipment and checking it; some new was necessary. Think that I'm almost ready! Starting to be concerned about drought. Very little water in our rain barrel in the last three weeks since putting it out and the greenhouse cistern ran out; supplementing the latter by borrowing from the big bag of water that stores solar heat for winter nights. Checked the house cistern and found it the lowest I've seen it, but still several hundred gallons; should get us through with some care. Watering garden sets is using a lot of water; usually don't need to do that often. The biggest concern is that this is fire weather: dry and windy and green-up is just starting. And we live out in the woods. That's why I have been thinning the balsam, the most fire-prone tree we have, and have lots more to do. The hazelnut area needs some but not too much more work. Spent yesterday moving small trees that would be in the way to where they will be appreciated. A good rationalization for having the backhoe. Again, they will need watering if it doesn't rain. Been enjoying walks out to the shelter while we can still see through the woods; when the understory leaves out, that changes until late in the year. The first mosquitoes have appeared. Few ticks and no black flies thank goodness. Karen's birthday was last week and sister Susan took her to the opera last Saturday. I went looking for morels down south, finding only four and some Dryad's Saddle Polyporus squamosus which is low on my list of edibles. But, choosing just the tender parts and soaking in water and a bit of lemon juice, it made a very fine addition to a fish dish I make, Huachanango a la Veracruzana (snapper Vera Cruz style though I used Sea Bass/Barramundi). Another mushroom recipe to post. And her trip report is nearly ready to post....really. OK so I'm primed for birds. Just recorded a new species for this location: Harris Sparrow, a large and handsome bird that breeds in the arctic and usually seen migrating on the prairies of western MN. Also have ten times the normal number of White-throated Sparrows, a boreal breeder. I checked with a couple of wind maps http://windy.com and http://hint.fm/wind/ which shows a strong wind up the central flyway but none to the north and contrary winds to the west. They're temporarily stuck here or blown here, whereas normally they would migrate right through. Very interesting. Trip report from Karen real soon. Got most of the sets and seeds in the garden that could survive a temperature dip: forecast of 32 F. But finally rain after a week of dry weather. That should get them going. Maples are budded out, the aspen have leaf buds, and birches have their catkins hanging out. Daffodils are blooming. Spring is here, yes. The Goldfinch on the feeder was so yellow it made my mouth water. Plus the Chipping Sparrow (rufous cap, black eye bar, no chest spot) and the Sapsucker make three new for the year this morning. And most of the warblers are still coming. April brought us 30 species and we got 2" of snow the last week. The birdwatching courses through Audubon at Duluth Folk School (now up and running) has sharpened my perception up a bit. Got a greenhouse full of sets waiting for the ground to warm up. Tomatoes are in the greenhouse although still waiting to harvest the garlic. Lots of lettuce. Got the Agaricus inter-planted with one bed of the tomatoes. Now that the snow is gone, I assembled a rack for mushroom logs in the shade behind our storage shelter, got last years logs out and soaked and racked them. Pallets for new logs there now, too. Outside, I'm digging up volunteer white pines (too close to the house) for a friend and for transplanting to where we want them. Still thinning the balsam which will involved moving some trees to plant the hazelnuts. Making a larger deer exclusion area, too. Lots to do. 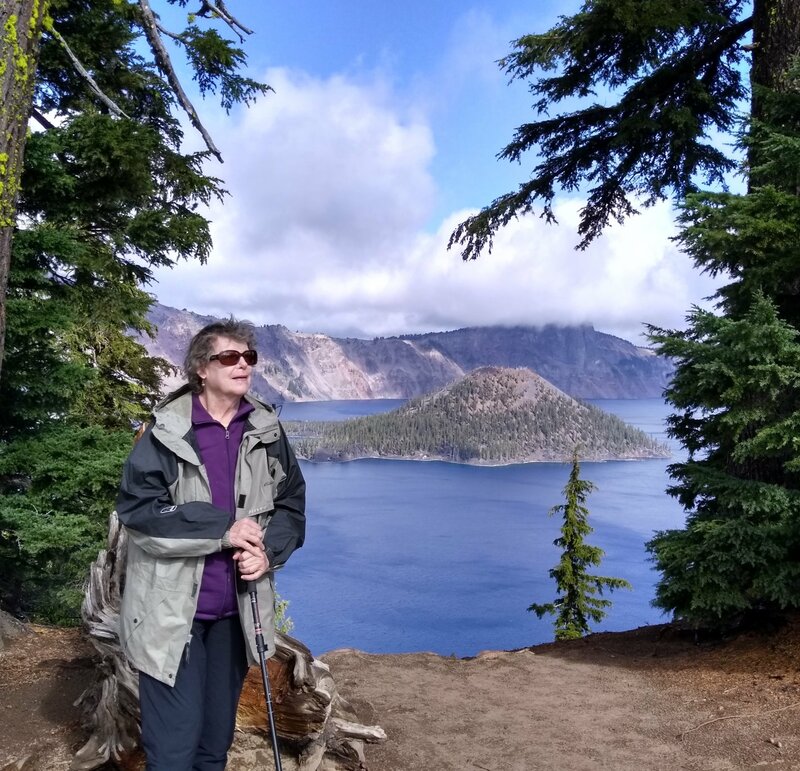 Karen has been in Oregon and Idaho on a river trip this last week, but we were able to stay in touch by phone. Shades of when I was building the house and Karen was working in the city. Sounds like she is having a great trip; will try to get a trip report up soon. Happy Spring! Enjoy it before the bugs get here. Seems like it's still winter although days are in the 50's and sunny. Snow was shrinking and mud season imminent before the recent 10+ inches of snow. Got to plow one more time. Still, when the sun shines, we don't need a fire; three days now. Which means the pizza we made in the bake oven might have been the last of the heating season. But....not taking the plow off the truck yet. Perhaps due to the late cold and snow and its effect on insect larvae, we had a Pileated woodpecker hanging on the peanut feeder! Other woodpecker, too. Pine Sisskins finally returned after being gone all winter (they migrate to the east; ?). Gene is taking Bird Watching 101 and 201 at Duluth Folk School and involved with Duluth Audubon, so learning is. Learning to cultivate new mushrooms, also. With the fir thinning, we have lots of small fir and aspen logs. Asked and got some ideas: Pholiota nameko, an Asian mushroom, Turkey tail Trametes versicolor, and a variety of oyster mushroom Pleurotus pulmonarius and trying them all. 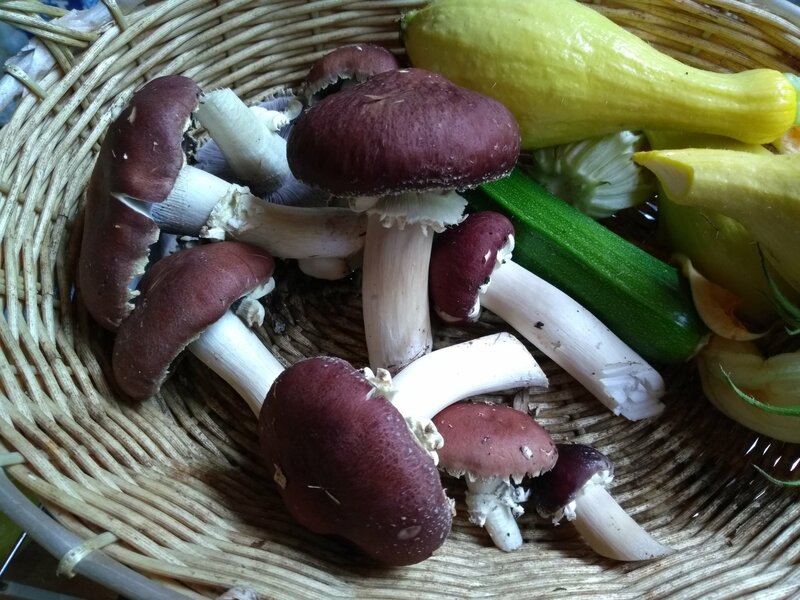 Also got the mushroom cultivation bug and inoculating logs with another variety of Shiitake, and one of the greenhouse beds with 'Almond Agaricus'. So I'm keeping busy keeping up with all that. Not that I'm lacking things to do. Keeping the deer off my trees is a full time occupation. Chipping the slash is carpeting the trails. Putting up more fencing to keep them off the homesite. Also skinning some of the fir for fenceposts and treating the ends for a deer fence to protect the hazelnuts I plan to plant. Lots to do. As 'calendar' Spring approaches, we're seeing some suggestions of that change. Interesting that the Swedish definition of Spring is the first full week of temps above freezing; that would be awhile here. But the snowbanks are shrinking, we're seeing more Redpols, stopped putting out suet for the birds to avoid the bears coming out of hibernation (they're here, but we don't see them). Deer are moving and more aggressive; put up more deer fence to keep them out of the yard. A few degrees warmer on average in the house and the kombucha is brewing faster or has changed back to a better scobe, and the kefir has found a happy culture; lots of sauerkraut left in the freezer. In the greenhouse the raab is nearing its end (many good meals), the celery survived and is prolific, and we have lots of baby greens. Early sets (Aliums, celery, beets & chard) are doing well; the Big Set Start is next week. We've stepped up our political activity: delegates from our caucus, alternates to district and state conventions. We have some local candidates that espouse our values and we're hopeful for positive change. The path to well-being is community--local and virtual. We need to break the oligarchy which we are headed. The winner-takes-all economics and politics leaves us bankrupt. Melanie Kline and Clive Hamilton see it clearly. Scary, very scary, but we need to act out of reason and ethics, not fear. I revert to working on the land for solace. My new toy is the larger chipper, using it to thin the balsam that is a fire hazard and chips for mushrooms. Also making space for hazelnut plantings and (maybe) a space for ducks/chickens in regenerative agriculture. Been participating in the Sustainable Farming Association and surprised that has a beneficial subculture. UMD for Seniors is about to start up for Spring Quarter. Gene has an Anishinabe course, both doing Tai Chi and GeoTravels with Ojakangas, Gene for a hiking group and Karen for others. Too bad it makes for more trips into town but is energizing. Hope you are looking forward to a growing Year. Sunshine anyway, although nighttime temps are single and double digits below zero this week. When the sun shines, the house warms up without a lot of other heating or morning fires. Our kind of 'fire season'--when the bakeoven is available--is great for cooking and eating watching the day's fire. Better than TV. Gene: I've started thinning out the 'dog hair' balsams (too thick) to avoid the other type of fire season. Starting near the house for firebreak. Also looking to replant the edges of the drive with hazelnuts; some hybrids and some native which are already in our woods. Looking at a lot of moving small trees and cages this spring, too. Nice but hard work. Love that we can see changes that are showing now after 10+ years. The foresters are still touting the 'thin to reduce competition' line while others can show that biodiversity supports better total health of the forest. Wish I could do silvapasture with goats, but that's a huge time commitment. We are into precinct caucuses this week, so that tension is up. At least we have some candidates who haven't totally sold out. Worrisome. We are taking a 'Climate of Hope' class at UMD for Seniors and will likely get solar electric here when we can, perhaps go to an electric car powered by solar. There are things we can do now. Leek sets are coming up as well as a batch of greens in the greenhouse. One of the mushroom logs in the greenhouse is starting to fruit. On Sunday, New Year's Eve day, in very cold weather, I saw a beautiful, sleek wolf just past the triple intersection on Thompson Lake Road. He crossed the road and then stood on the side for a bit and looked at me; I'd come to a dead stop when I saw him and just looked back. I saw him again near the same place on the way home; there was very little traffic that day and he was walking down Tracy Road and melted into the woods by Thompson Lake Road and was close enough that I could see him watching me. What a beautiful animal! Our neighbors Martha and Hilary who live on Thompson Lake say that something has been raiding the garbage cans left out for pickup and hope it isn't this wolf, because if so he will be shot. I haven't seen him again but we have wolf tracks all over our property, especially out at the southern boundary by the huge pile of maple logs that Gene cut down and split in fall, 2015. Miss Bea is always very interested when I take her walking out there. A couple weeks ago I was following deer tracks across the drive and nearly walked in to a bird's nest at eye height between two aspen at the west side of our road; it has snow on it now but I'm hoping it will be re-used this spring. Walking along Cannonball Lake Road it is deer and wolf city: many tracks and other wolf signs (urine); Miss Bea never fails to sniff the wolf pee and then mark it, four separate times, before I can convince her to move on. Deer prints and droppings are everywhere, and especially on our shelter trail: every 10 feet is another deer highway with droppings. I have also seen some fox tracks every so often along the road, but not in proximity to wolf tracks. I'm seeing groups of deer near the highway on the way home, they bunch up close to the highway and then all stand there and stare at me, and I often have to beep at a deer or two standing in the middle of Thompson Lake Road when I'm driving home at night, just to get them to move. There are too many when one sees them as often as I am! So far, it's been a very interesting winter for animal life. Finally a reprieve from subzero weather! We even had a number of morning fires to keep the house reasonable. Living here requires a willingness to thrive with a significant temperature flux; so far, so good. Not much snow as yet. Been sledding the maple in; there's enough snow for that. But minimal plowing. Wood is holding out well even with big fires this week. Rant Warning: Winter is a good time for reading. Anyone concerned about the looming climate crisis ought to read Naomi Klein's "This Changes Everything." Although written a couple of years ago, the book is packed with information and thoughtful analysis that should change attitudes. Also reading E.O. Wilson's last couple of books that show remarkable optimism for us regarding eusocial humans and how to support nature on earth. We have a lot of work to do in a very short time. We may get politically organized soon, also. Very dissapointed in our conressional representative--a Democrat who has mouthed environmental supports in the past--abandoning us by supporting sulfide mining in Minnesota by a notorius Chilean corporation. The majority of Minnesotans oppose that, but the DFL figures that they could lose the northern Minnesota electorate; indeed the majority there voted for Trump. The rhetoric goes that they did well with iron mining (debatable) and turn a blind eye to the fact that there never has been a sulfide mine that didn't leak and pollute. To say nothing about the need to keep more of the earth undeveloped and reduce population; the rhetoric goes that "Our kids should be able to get a job here" regardless of chronic, population-related problems. The data--a recent employment study--shows differently; the jobs sulfide mining would produce are an order of magnitude less than the corporation's rhetoric, and most of those would be brought in from elsewhere, with the inevitable increase in crime. In fact, with the limited timeline of the mine and loss of tourism and retirement income due to the contamination of habitat, mining would reduce employment in the area over a couple of decades. This just postpones the problem while creating others. So we're supporting an alternative candidate for congress that comes closer to our needs, although third parties have a dismal record; we'll see. Anyway, living out in the woods does not insulate one from political concerns, for sure. OK, End Rant. The gardening year commences by starting sets for leeks, celery, and greens for the greenhouse. Did my "winter gardening" and reviewed this year and ordered seeds for the spring. It won't be that long, but lots of winter to get there. Life in the woods continues. Was able to cut and split next year's already-a-year-old wood, and as soon as snow allows, I'll begin to sled in about a cord of maple that has been drying in the woods. Not enough snow to do much skiing or snowshoeing yet; pack boots suffice. After recent travels, we decided to stick close to home this winter. Works better to manage keeping the house warm and it is quiet (mostly) and lovely in the winter. Enjoy finishing up some of the remaining home-building tasks: trim, additional wiring and such. Snow up to several inches is easily cleaned off the walk and drive. I'm working on an "Owner's Manual" for the home; there is quite a bit here that is unlike suburban tract houses. It has its benefits; even in sub-zero weather, a sunny late morning in the greenhouse paying attention to things is remarkably restorative. Dog walks are enjoyable and an opportunity to keep up with (wild) neighbors' activities. No activity on the shiitake innoculated logs last year yet, but brought a couple into the greenhouse just in case they might fruit over the winter. I often cogitate about managing the years of bearing on these logs; there is lots of info on inoculation but little on timing and tweaking the humidity, light, soaking, etc. I've always taken a 'just give it time' approach but think there is likely more to it than that. Despite the moisture last summer, it was a thin year for mushrooming; maybe this coming year.